After sorting through my own selection of Argentine tango shoes I decided to let go some of my unused ones too. One pair by “PH Zapatos para bailar” and the other one by “Comme il Faut”. 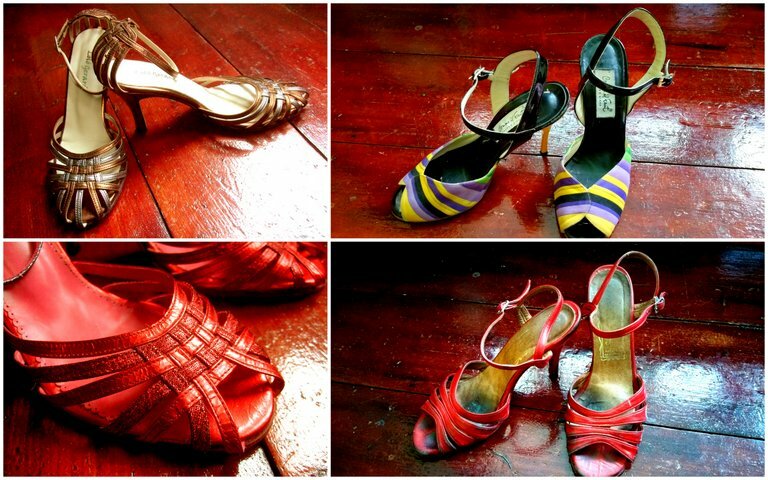 And I have still two pairs of new tango shoes from Buenos Aires “Lolo Gerard” for sale. I will bring these tango shoes to the following tango events in the Bristol area, to Hereford, Herefordshire, Gloucestershire, in the Forest of Dean and Kington Langley, Chippenham, Wiltshire. Alternatively, if you want me to bring the tango shoes to my tango classes in Lydney or Newland (the Forest of Dean, Gloucestershire) or to Hereford please contact me in advance. Please check in Group Classes for the actual dates. If you are interested in one or more pairs please contact me directly via info (at) movingexperience (dot) eu. Many tango dancer would say the best brand is “Comme il Faut (from Buenos Aires)”. They do very fancy tango shoes on the high end side and their tango shoes selling at about £150-170. This lovely pair of “Comme il Faut” has only been used a few times and ended up in my shoe cabinet for some years. It has its little marks of use around the black part of the heel, but all in all it’s in a very good state. It comes with an original Comme il Faut shoe bag too. Those red tango shoes have been made for me in Buenos Aires. They have been used a bit but are still in good shape. A bit of red shoe creme will definitely make them look like new again.